This week we begin our celebration of the New Year’s Eve 23,355 AD, or as it is known in New Eden: 119 YC. This new dating system commemorated a time in which the empires, along with the Jove, joined together for the peace and prosperity of the cluster. But as we move into the new year, we have little peace and much to be concerned about. With the rise of the Empyrean Age we grew rapidly as a people. Much like space travel, or the invention of the written word before it, the invention of true immortality propelled us forward to an entirely new level of understanding of our universe. However, with that understanding came consequences. Jamyl Sarum and her cronies in their hubris reincarnated the Empress-to-be and unleashed upon the universe not only the single most devastating event in the known history of the cluster, but also let loose what could be the most dangerous threat humankind has ever faced: a rogue artificial intelligence with the ability to command technology beyond our understanding. Jamyl and her assistants refused the mandate of Shathol’Syn and cloned her using illegal methods in order to attempt to install her onto the throne, in spite of losing in the ancient trials of fire and blood. During this process, the now late Empress’ mind was invaded by an entity known as the “Other”, a rogue artificial intelligence born from the virtual reality “Construct” of the enigmatic Sleepers. Under either the control or suggestion of the Other, Jamyl began a project to plunder the Conclaves of the Sleepers, delving deep into the mysterious Anoikis space. They began ripping out the implants of still living Sleepers in order for them to be used in her new breed of immortal soldiers, the Templars. However, these Templars were scarred from this tainted technology and the Sleepers drove them mad with visions of fire, blood, and ‘514’. While eventually this project was scrapped for more stable systems in time for the Dust soldiers to enter mass production, this was not before thousands, if not millions, of Sleepers were murdered. None of this would have been possible if not for the earlier acts of hubris by Jamyl and her follower concerning the Terran Superweapon. 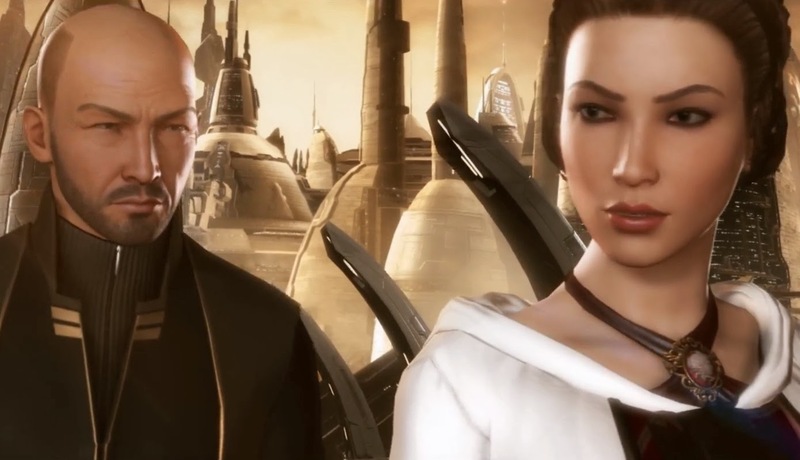 The Amarr had been plunged into chaos after the assassination of Doriam II, who had won the throne from Jamyl. Seeing an opportunity, the Minmatar teamed up with their nomadic offshoot, the Thukker tribe, to form a massive invasion force known as the Elder Fleet. This fleet crushed the Amarr resistance and made it as far as Sarum Prime before Jamyl appeared and destroyed the fleet with spectacular effect. The Terran superweapon turned the shields of the Minmatar vessels inwards, crushing them like tin cans with their very defenses. Later a Blood Raider fleet, covertly trailed by a Thukker ship, found Jamyl’s superweapon in a Drone cache. This weapon used a rare isotope of Isogen known as Isogen-5, a highly unstable and powerful form that was being collected by the Rogue Drones for unknown reasons. In a desperate attempt to thwart the Blood Raider’s attempt to recover the weapon, the Thukker ship shot and destroyed the weapon and its cache of Isogen-5. What no one knew at the time was that all of the Isogen-5 was entangled on a quantum level. What this means is when that cache went up, all of the Isogen-5 collected in any quantity in the entire cluster detonated. This caused the disruption of ten blue stars which led to shattered planets and untold damage in what is now known as the Seyllin incident. Without this event, we have no wormholes, no Sleepers, no Drifters, and as we have come to find out, no Caroline’s Star. The Seyllin Incident was the single most destructive event in recent history. Thankfully, the destructive force was not as extensive as the Jovians predicted and instead of destroying the cluster, it simply disabled the gate network attached to Jovian space. Many suspect that this is partially due to the fact that the Jove split their gates off of the main gate network years previously. It also seemed to have the side effect of causing Jovian technology to fail throughout the cluster, leading to the appearance of Jovian Observation Towers throughout the known cluster. This revealed the method and extent of the spy network the Jovians used to monitor the other races, but not a firm understanding of how the Jovian tech functioned. Before anyone could respond the Seekers, and soon after the Drifters, began their incursions into known space. They showed particular interest in the decloaking towers. Soon after the Drifters began harvesting something from the towers known as “antikythera”. Around the same time as the change in Sleeper behavior that accompanied the Caroline Star event, Jamyl retreated from public eye, not to be seen until the unveiling of her new flagship: the Auctoritas. The handover ceremony for that very flagship was the site of Jamyl’s final demise at the hands of the Drifters. Soon the Amarrians, led by the corrupted Jamyl began research to better understand the Drifter technology. At the same time, the Sisters of EVE, long interested in wormholes and Anoikis, were exposed to have several research stations in a before undiscovered wormhole named Thera. Both groups began diving into the emerging Drifter threats alongside capsuleer agents. The Amarr unveiled their new technology first: the Entosis link. Based on the poorly understood Antikythera element, the Entosis link allows capsuleers to project their mind, also known as the infomorph, into computer systems. Additionally, it just so happened that this technology was the key to disrupting the other powerful technology released by Jamyl herself: unkillable shields. This nearly instantly mandated the use of the new Entosis technology throughout the cluster, regardless of the unknown dangers of this alien equipment. Not to be outdone, the Sisters of EVE had been conducting secret research on the Drifters and their technology for quite some time. The Thera outposts predated the Caroline Star event, and Sisters can be seen conducting research operations throughout the areas now classified as “Drifter wormholes”. The central focus of Sisters research seems to be the Sleeper/Jovian biology. They released “Project Discovery” to the Empyrean population, bribing the immortals with special mind-quickening drugs that they scavenge from the Drifter sites. That effort has also resulted in the development of the so-called “Alpha clone” technology. As with Entosis, there is almost nothing known publically about this technology as it has even been kept secret even from CONCORD. Historically, the Sisters have been unhappy with the Empyreans, seeing them as a threat to many baseliner populations. However, this seems like a strong pivot of their position, suddenly providing the gift of immortality to an ever increasing population. In fact, this move does not seem unanimous and the Sisters seem divided, as a splinter group known as the Pharos of Thera have issued several warnings of the use of this technology. What became of the Other that resided within Jamyl’s head? Why was the Isogen-5 being collected by the Rogue Drones (and perhaps others)? Who exactly were the Talocan and what other artifacts did they leave behind? What consequences will result from the unregulated use of Drifter technology? What really was the fate of the inquisitive Hilen Tukoss? What will come from the increasing infighting of the Caldari, the shattered Amarr, the emboldened Minmatar, or the corrupt and secretive Gallente in their continued proxy war occurring in low security space? All these questions and more will continue to be asked as we move into YC 119. Our understanding of our cluster and history continues to grow but the threats grow ever greater. What we have discovered about the Drifters is truly terrifying, and even more so that they have begun to either construct or transport their massive hives into our known space. It appears more and more that it will be the responsibility of the Empyreans to uncover the truth, and perhaps to be the final safeguard of life as we know it. Do you want to know more? The EVE Lore Primer is the starting place for discovery of the cluster of New Eden.